Behold, here we are gathered for a ceremony, which is certainly historic. Let me, first of all, give you some information. The first might surprise you a little, as it did me. Yesterday evening, a visitor came, sent from the nunciature in Berne, with an envelope containing an appeal from our Holy Father the Pope, who was putting at my disposal a car which was supposed to take me to Rome yesterday evening, so that I would not be able to perform these consecrations today. I was told neither for what reason, nor where I had to go! I leave you to judge for yourselves the timeliness and wisdom of such a request. I went to Rome for many, many days during the past year, even for weeks; the Holy Father did not invite me to come and see him. I would certainly have been glad to see him if some agreement would have been finalized. So here you have the information. I give it to you simply, as I myself came to know it, through the letter from the nunciature. Now, some indications concerning the ceremony and some relevant documents regarding its significance. The future bishops have already sworn in my hands the oath which you find in the little booklet on the ceremony of consecration which some of you have. Thus, this oath has already been pronounced, plus the Anti-Modernist Oath, as it was formerly prescribed for the consecration of bishops, plus the Profession of Faith. They have already taken these oaths and this profession in my hands after the retreat which took place at Sierre during these last days. Do not, therefore, be surprised if the ceremony begins with the interrogations on the Faith, the Faith which the Church asks from those to be consecrated. I also want to let you know that, after the ceremony, you will be able to ask the blessing of the bishops and kiss their rings. It is not the custom in the Church to kiss the hands of a bishop, as one kisses the hands of a newly-ordained priest, as you did yesterday. But the faithful may ask for their blessing and kiss their ring. Lastly, you have at your disposal at the bookstall some books and flyers which contain all the elements necessary to help you better understand why this ceremony, which is apparently done against the will of Rome, is in no way a schism. We are not schismatics! If an excommunication was pronounced against the bishops of China, who separated themselves from Rome and put themselves under the Chinese government, one very easily understands why Pope Pius XII excommunicated them. There is no question of us separating ourselves from Rome, nor of putting ourselves under a foreign government, nor of establishing a sort of parallel church as the Bishops of Palmar de Troya have done in Spain. They have even elected a pope, formed a college of cardinals… It is out of the question for us to do such things. Far from us be this miserable thought of separating ourselves from Rome! On the contrary, it is in order to manifest our attachment to Rome that we are performing this ceremony. It is in order to manifest our attachment to the Eternal Rome, to the pope, and to all those who have preceded these last popes who, unfortunately since the Second Vatican Council, have thought it their duty to adhere to grievous errors which are demolishing the Church and the Catholic priesthood. Thus you will find among these flyers which are put at your disposal, an admirable study done by Professor Georg May, President of the Seminary of Canon Law in the University of Mayence in Germany, who marvelously explains why we are in a case of necessity: necessity to come and help your souls, to help you! Your applause a while ago was, I think, not a purely temporal manifestation; it was rather a spiritual manifestation, expressing your joy to have at last Catholic bishops and priests who are dedicated to the salvation of your souls, to giving to your souls the Life of Our Lord Jesus Christ, through good doctrine, through the Sacraments, through the Faith, through the Holy Sacrifice of the Mass. You need this Life of Our Lord Jesus Christ to go to heaven. This Life of Our Lord Jesus Christ is disappearing everywhere in the Conciliar Church. They are following roads which are not Catholic roads: they simply lead to apostasy. This is why we do this ceremony. Far be it from me to set myself up as pope! I am simply a bishop of the Catholic Church who is continuing to transmit Catholic doctrine. I think, and this will certainly not be too far off, that you will be able to engrave on my tombstone these words of St. Paul: "Tradidi quod et accepi - I have transmitted to you what I have received," nothing else. I am just the postman bringing you a letter. I did not write the letter, the message, this Word of God. God Himself wrote it; Our Lord Jesus Christ Himself gave it to us. As for us, we just handed it down, through these dear priests here present and through all those who have chosen to resist this wave of apostasy in the Church, by keeping the Eternal Faith and giving it to the faithful. We are just carriers of this Good News, of this Gospel which Our Lord Jesus Christ gave to us, as well as of the means of sanctification: the Holy Mass, the true Holy Mass, the true Sacraments which truly give the spiritual life. Please, we beseech you, what are you going to do with our teachings, with our preaching, with the Catholic Faith? Are you going to abandon it? Are you going to let it disappear from this earth? Please, please, continue to keep this treasure which we have given you. Do not abandon the faithful, do not abandon the Church! Continue the Church! Indeed, since the Council, what we condemned in the past the present Roman authorities have embraced and are professing. How is it possible? We have condemned them: Liberalism, Communism, Socialism, Modernism, Sillonism. All the errors which we have condemned are now professed, adopted and supported by the authorities of the Church. Is it possible? Unless you do something to continue this Tradition of the Church which we have given to you, all of it shall disappear. Souls shall be lost. Thus, we find ourselves in a case of necessity. We have done all we could, trying to help Rome to understand that they had to come back to the attitudes of the holy Pius XII and of all his predecessors. Bishop de Castro Mayer and myself have gone to Rome, we have spoken, we have sent letters, several times to Rome. We have tried by these talks, by all these means, to succeed in making Rome understand that, since the Council and since aggiornamento, this change which has occurred in the Church is not Catholic, is not in conformity to the doctrine of all times. This ecumenism and all these errors, this collegiality - all this is contrary to the Faith of the Church, and is in the process of destroying the Church. This is why we are convinced that, by the act of these consecrations today, we are obeying the call of these popes and as a consequence the call of God, since they represent Our Lord Jesus Christ in the Church. "And why, Archbishop, have you stopped these discussions which seemed to have had a certain degree of success?" Well, precisely because, at the same time that I gave my signature to the Protocol, the envoy of Cardinal Ratzinger gave me a note in which I was asked to beg pardon for my errors. But if I am in error, if I teach error, it is clear that I must be brought back to the truth in the minds of those who sent me this note to sign. "That I might recognize my errors" means that, "if you recognize your errors we will help you to return to the truth." What is this truth for them, if not the truth of Vatican II, the truth of the Conciliar Church? Consequently, it is clear that the only truth that exists today for the Vatican is the conciliar truth, the spirit of the Council, the spirit of Assisi. That is the truth of today. But we will have nothing to do with this for anything in the world! That is why, taking into account the strong will of the present Roman authorities to reduce Tradition to nought, to gather the world to the spirit of Vatican II and the spirit of Assisi, we have preferred to withdraw ourselves and to say that we could not continue. It was not possible. We would have evidently been under the authority of Cardinal Ratzinger, President of the Roman Commission, which would have directed us; we were putting ourselves into his hands, and consequently putting ourselves into the hands of those who wish to draw us into the spirit of the Council and the spirit of Assisi. This was simply not possible. This is why I sent a letter to the pope, saying to him very clearly: "We simply cannot (accept this spirit and proposals), despite all the desires which we have to be in full union with you. Given this new spirit which now rules in Rome and which you wish to communicate to us, we prefer to continue in Tradition; to keep Tradition while waiting for Tradition to regain its place at Rome, while waiting for Tradition to re-assume its place in the Roman authorities, in their minds." This will last for as long as the Good Lord has foreseen. It is not for me to know when Tradition will regain its rights at Rome, but I think it is my duty to provide the means of doing that which I shall call "Operation Survival," operation survival for Tradition. Today, this day, is "Operation Survival". If I had made this deal with Rome, by continuing with the agreements we had signed, and by putting them into practice, I would have performed "Operation Suicide." There was no choice, we must live! That is why today, by consecrating these bishops, I am convinced that I am continuing to keep Tradition alive, that is to say, the Catholic Church. You well know, my dear brethren, that there can be no priests without bishops. When God calls me - this will certainly not be long - from whom would these seminarians receive the Sacrament of [Holy] Orders? From conciliar bishops, who, due to their doubtful intentions, confer doubtful sacraments? This is not possible. Who are the bishops who have truly kept Tradition and the Sacraments such as the Church has conferred them for 20 centuries until Vatican II? They are Bishop de Castro Mayer and myself. I cannot change that. That is how it is. Hence, many seminarians have entrusted themselves to us, they sensed that here was the continuity of the Church, the continuity of Tradition. And they came to our seminaries, despite all the difficulties that they have encountered, in order to receive a true ordination to the priesthood, to say the true Sacrifice of Calvary, the true Sacrifice of the Mass, and to give you the true Sacraments, true doctrine, the true catechism. This is the goal of these seminaries. So I cannot, in good conscience, leave these seminarians orphaned. Neither can I leave you orphans by dying without providing for the future. That is not possible. It would be contrary to my duty. This is why we have chosen, with the grace of God, priests from our Society who have seemed to us to be the most apt, whilst being in circumstances and in functions which permit them more easily to fulfill their episcopal ministry, to give Confirmation to your children, and to be able to confer ordinations in our various seminaries. Thus I believe that with the grace of God, we, Bishop de Castro Mayer and myself, by these consecrations, will have given to Tradition the means to continue, given the means to Catholics who desire to remain within the Church of their parents, their grandparents, of their ancestors. They built churches with beautiful altars, often destroyed and replaced by a table, thus manifesting the radical change which has come about since the Council regarding the Holy Sacrifice of the Mass which is the heart of the Church and the purpose of the priesthood. Thus we wish to thank you for having come in such numbers to support us in the accomplishment of this ceremony. We turn to the Blessed Virgin Mary. You well know, my dear brethren, you must have been told of Leo XIII's prophetic vision revealing that one day "the See of Peter would become the seat of iniquity." He said it in one of his exorcisms, called "The Exorcism of Leo XIII." Has it come about today? Is it tomorrow? I do not know. But in any case it has been foretold. Iniquity may quite simply be error. Error is iniquity: to no longer profess the Faith of all time, the Catholic Faith, is a grave error. If there ever was an iniquity, it is this. And I really believe that there has never been a greater iniquity in the Church than Assisi, which is contrary to the First Commandment of God and the First Article of the Creed. It is incredible that something like that could have ever taken place in the Church, in the eyes of the whole Church —how humiliating! We have never undergone such a humiliation! You will be able to find all of this in Fr. LeRoux's booklet [Peter, Lovest Thou Me? —webmaster] which has been especially published in order to give you information on the present situation in Rome. It was not only the good Pope Leo XIII who said these things, but Our Lady prophesied them as well. Just recently, the priest who takes care of the Society's priory in Bogota, Colombia, brought me a book concerning the apparition of Our Lady of "Buen Suceso," - of "Good Fortune," to whom a large church in Quito, Ecuador, was dedicated. They were received by a nun shortly after the Council of Trent, so you see, quite a few centuries ago. This apparition is thoroughly recognized by Rome and the ecclesiastical authorities; a magnificent church was built for the Blessed Virgin Mary wherein the faithful of Ecuador venerate with great devotion a picture of Our Lady, whose face was made miraculously. The artist was in the process of painting it when he found the face of the Holy Virgin miraculously formed. And Our Lady prophesied for the 20th century, saying explicitly that during the 19th century and most of the 20th century, errors would become more and more widespread in Holy Church, placing the Church in a catastrophic situation. Morals would become corrupt and the Faith would disappear. It seems impossible not to see it happening today. I excuse myself for continuing this account of the apparition, but she speaks of a prelate who will absolutely oppose this wave of apostasy and impiety - saving the priesthood by forming good priests. I do not say that prophecy refers to me. You may draw your own conclusions. I was stupefied when reading these lines but I cannot deny them, since they are recorded and deposited in the archives of this apparition. Of course, you well know the apparitions of Our Lady at La Salette, where she says that Rome will lose the Faith, that there will be an "eclipse" at Rome; an eclipse, see what Our Lady means by this. And finally, closer to us, the secret of Fatima. Without a doubt, the Third Secret of Fatima must have made an allusion to this darkness which has invaded Rome, this darkness which has invaded the world since the Council. And surely it is because of this, without a doubt, that John XXIII judged it better not to publish the Secret: it would have been necessary to take measures, such steps as he possibly felt himself incapable of doing, e.g., completely changing the orientations which he was beginning to take in view of the Council, and for the Council. There are the facts upon which, I think, we can lean. We place ourselves in God's providence. We are convinced that God knows what He is doing. Cardinal Gagnon visited us 12 years after the suspension: after 12 years of being spoken of as outside of the communion of Rome, as rebels and dissenters against the pope, his visit took place. He himself recognized that what we have been doing is just what is necessary for the reconstruction of the Church. The cardinal even assisted pontifically at the Mass which I celebrated on December 8, 1987, for the renewal of the promises of our seminarians. I was supposedly suspended and, yet, after 12 years, I was practically given a clean slate. They said we have done well. Thus we did well to resist! I am convinced that we are in the same circumstances today. We are performing an act which apparently… - and unfortunately the media will not assist us in the good sense. The headlines will, of course, be "Schism," "Excommunication!" to their heart's content - and, yet, we are convinced that all these accusations of which we are the object, all penalties of which we are the object, are null, absolutely null and void, and of which we will take no account. Just as I took no account of the suspension, and ended up by being congratulated by the Church and by progressive churchmen, so likewise in several years - I do not know how many, only the Good Lord knows how many years it will take for Tradition to find its rights in Rome - we will be embraced by the Roman authorities, who will thank us for having maintained the Faith in our seminaries, in our families, in civil societies, in our countries, and in our monasteries and our religious houses, for the greater glory of God and the salvation of souls. 1 The media and especially the Catholic diocesan papers all conveniently forgot this schism of the national Chinese Church, which was the occasion at which an excommunication was put for episcopal consecrations without papal mandate. 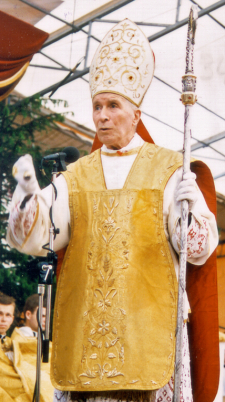 They claimed that the so-called schism of Archbishop Lefebvre was the first since the schism of Dollinger and the "Old Catholics" after Vatican I. This claim is inaccurate and their parallel does not stand in the face of history. However, comparing 1988 with the Chinese Church would have shown the dissimilarity, as Archbishop Lefebvre does here. 2 See Part II, June 19, 1988. 3 Please note that many reporters have misunderstood the Archbishop who did not say "Zionism" but "Sillonism," an error condemned by St. Pius X in 1910.